Ten years ago I took an entry-level economics class at school. It was September 2008. Lehman Brothers had just filed for bankruptcy. ‘It’s certainly an interesting time to be studying economics!’ the teacher said. It was – but you wouldn’t have known from the syllabus. There was nothing about the financial system. There were, however, plenty of elegant abstractions, showing the intersection of supply and demand in a timeless, spaceless universe. Fortunately, there is a growing constituency of progressive, unorthodox economists who do understand these exotic monstrosities. And when I reached out to them to speculate about possible candidates for the next financial crisis, they were all too ready to contribute: the Eurozone, trade wars, shadow banking, central banks… At least next time we won’t be surprised when it happens. 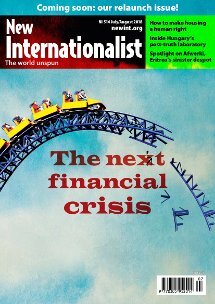 A positive prospect on the horizon is the redesigned and relaunched New Internationalist. From September 2018 we will become a bimonthly publication, giving us more space to go in-depth, with long-form features, more visual treatments and, as always, a rigorous sense of inquiry into the political, economic and social issues of our day and our world. Sharp analysis and in-depth global coverage delivered to your door, mobile or in-box. Plus, access the entire archive of over 500 issues with our digital edition. Wame Molefhe profiles Botswana, where prosperity has morphed into corruption and inequality. Highlights from the major documentary film festival held annually in Toronto, Canada. We put the President of Eritrea’s track record – liberation fighter turned ruthless dictator – under the spotlight. Is the ‘Data Mafia’ here to stay? From the moment you were born, The Man With The Data knew you better than you knew yourself. Omar Hamdi explains. You can see our whole archive on the past magazines page. Trade in turmoil: A chance for justice?